The great majority of economists in Malthus’s time denied the possibility of aggregate over-supply or involuntary unemployment. Ricardo and James Mill believed in Say’s Law. Even saving was said to be spending, and a deficiency of total demand was an exception. Malthus, anticipating Keynes, argued that the savers are putting a brake on economic growth that can only become worse as income in the process of secular stagnation is transferred away from the natural spenders. 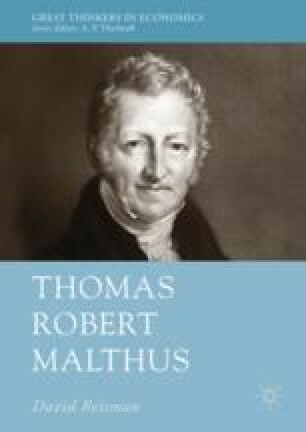 In his second great book, the Principles of Political Economy of 1820, Malthus addressed the threat of excessive withdrawals from the circular flow. Although his definition of the national product is different from that of more modern statisticians like Stone, he continued the practice begun by Quesnay of treating the macroeconomy as a whole that is different from the sum of the households and the firms.